I’ve been reading about hostels for years and for whatever reason, missed the boat on the hostel experience while backpacking through Europe in my 20s. I found budget accommodation elsewhere, in cheap hotels or B&Bs. The idea of sharing a dorm was not something I was comfortable with, especially with a bunch of people I didn’t know. Yet, I was always fascinated with the concept because of my budget-travel mindset. Now I’m older, I’m a little more wiser. A little more experienced with life and people. And, I’m more prone to research a little deeper on alternative options. I mean really, how much different is dorm accommodation than camping? When you think about it, the concepts are pretty much the same. 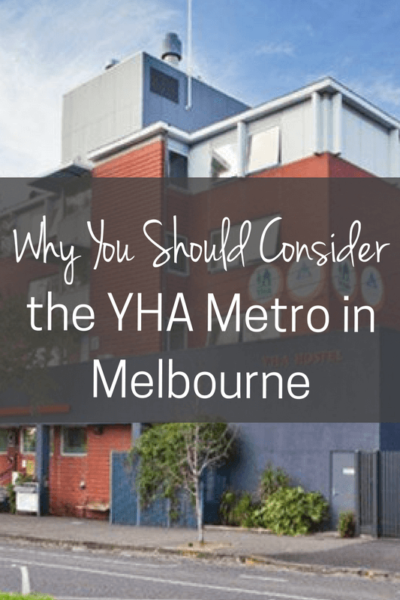 After hearing about the Melbourne YHA Metro from a number of sources, I thought it would add a different element to our girly getaway to Melbourne. After all, our travel mantra is “Try Something Different”. 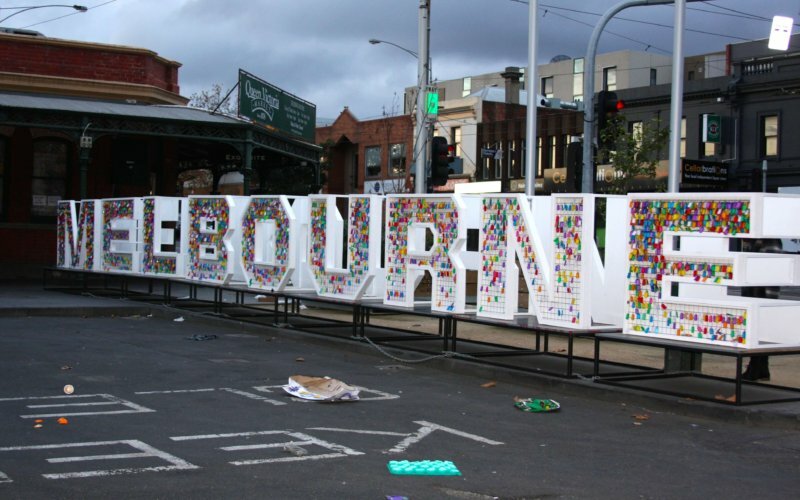 Everything I read about the Melbourne YHA Metro was positive: clean, convenient, inexpensive. It offered all the things we like when we travel: free Wifi, cooking facilities, convenience to all we’d like to see…and private bathrooms. 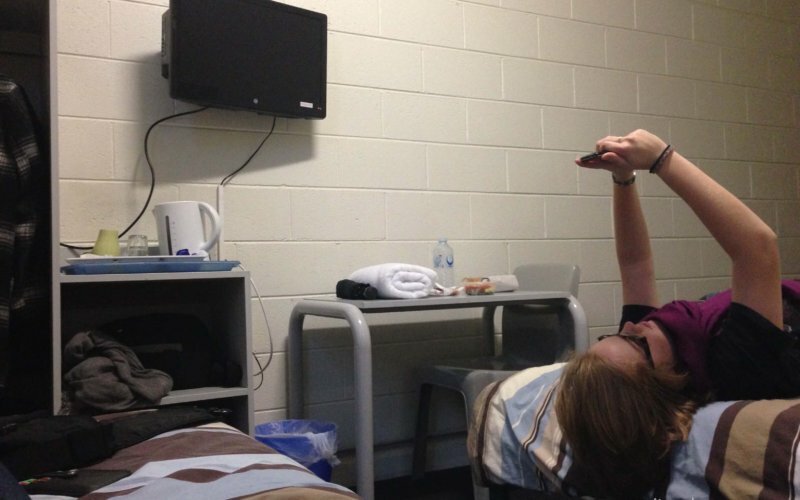 When we travelled to Melbourne Natalie was a minor, so we were required by law in Australia stay in a private room. Worked for me, because while I was still okay with the idea of a hostel, I still couldn’t get my head about sharing a room. Luckily hostels now offer private rooms, some even with private bathrooms, which is what we lucked out with at the Melbourne YHA Metro. I knew that there was another YHA hostel closer to the action in Melbourne, but the YHA Metro was the one I had read recommendations for, so I went with that one. It was super easy to find and out of the hustle and bustle. Bonus! I needn’t have worried as there was a sound proof door between those areas and our room, which was also tucked in at the end of a hallway, at the opposite end of all the happening stuff. Even so, the place was dead quiet after 10pm. All we needed was a clean bathroom and a warm place to sleep with clean linens. Our room was basic but had everything we needed. It almost reminded me of a convent in how simple and utilitarian it is. I was surprised that we had heating in our room. I don’t know why. I guess I wasn’t expecting it for as basic a stay as this. Luckily we had it though because winter in Melbourne can be cold! It provided a comfortable heat (not oppressive as many hotel rooms can quickly become) and was quick to warm the room – which was great after wandering the city for hours. I was equally surprised to find not only a TV/DVD player (you can borrow movies from reception and watch them in your room), but also tea and coffee making facilities. This place was great! WiFi was also available and free in the public areas. Yes, I am a girl that needs little and is happy with basic extras like these. We had plenty of room, although when the bags were out and being sorted through, it got a little tight, but that’s normal in any hotel I think. The communal kitchen was large and accommodated a number of folks in the various stages of cooking and cleaning up at the same time. The fridge space was plentiful and none of which were full, and with a roll of stickers available so people could label their food, convenient. When not in the mood to cook, the YHA Metro offered a small café that offered basic fare at reasonable prices. We ordered a small pizza along with a garden salad, totaling around $12, which we shared between the two of us. It was enough to sate us happily and with very little effort. One of the perks of the YHA Metro was the top floor. It was a clear retreat for those needing some peace and quiet, especially since the lounge was warm and provided scattered bean bags to hang out in. 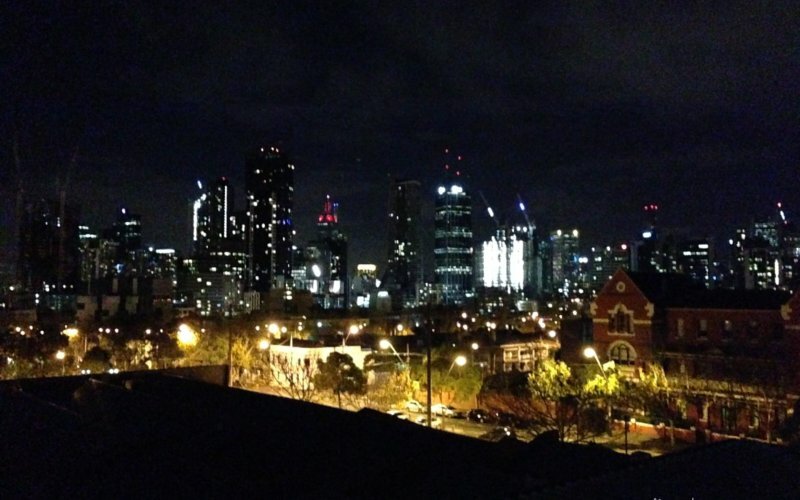 Outside was a rooftop terrace with 360 degree city views which I am sure is a popular place in warmer weather. Parking is also available (at $7 a day, pre booked), as are laundry facilities, neither of which we needed although both would be a wonderful bonus for people travelling through and/or travelling longer term. What surprised me most of all about this the YHA Metro was the sense of respect amongst travellers. I did not feel uncomfortable or out of place while we were there. Even as we hung out in the dining room one night, young and older travellers alike came and went. Some stopped and talked to others. Others just came, made their dinner and left. Groups came and huddled together before heading out for the evening. Families, both with young ones as well as others with teens, came together to eat after all pitching in with both dinner preparations and clean up. It made me realise we were all there for the same reason: we just wanted a cheaper alternative for accommodation, while still having the conveniences we appreciated as we travelled, whether we were travelling for a week or a decade. As travelers, we are all the same. I will stay at a YHA again. I will eventually get a membership when I know I will use it to it’s full benefit. 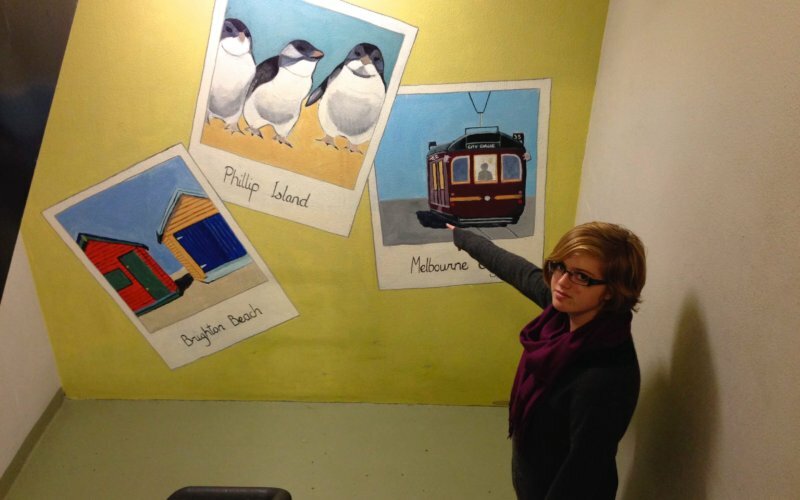 Until then, I will simply say this: I highly recommend the Melbourne YHA Metro. It is great for anyone looking for a cheaper place to stay, yet still have the city conveniences at your fingertips. PLEASE NOTE: I have not been paid to write this post, nor is it sponsored. This is a true recommendation. It’s great you finally stayed in a hostel, Tara. And you definitely chose well. I used to collect passengers there as well as other hostels and the staff were always so good. Yeah to hostels!